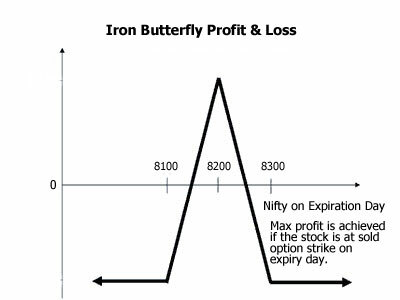 Iron Butterfly is one trade that a lot of traders in India try. So this article may be help to a lot of traders. This trade can be done when there is a sudden rise in volatility and the trader expects the volatility to drop in a few days and the stock to be range bound. Both volatility drop and passage of time helps the iron butterfly trade. 4) Buy One OTM (out of the money) Put Option. The OTM call option is bought to protect the unlimited loss in the sold call option. And the OTM put option is bought to protect the unlimited loss in the sold put option. NOTE: The trade brings profits only if Volatility drops in a few days, if it does not the trader should close the trade. If not closed the trade will be in loss with even a slight increase in volatility. This is very important: Iron Butterfly is a Volatility play and NOT a directional or non-directional trade like what most traders think. Its results depends a lot on what happens to volatility after the trade is made. Direction of the stock within a small range will not effect much if lot of time remains for expiry. However if stock moves a lot fast, and volatility does not decrease, the trade stands to lose. Why Iron Butterfly depends a lot on volatility? Because ATM options have the highest time value or theta – volatility therefore has a lot of affect on these options. For example if Nifty is at exactly at 8300, then both the ATM options will have zero intrinsic value which means whatever premium they have is nothing but time value and prevailing volatility. 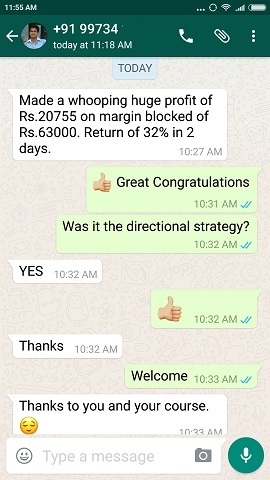 Assuming that both ATM call option and PUT option have a premium of 150 at the start of the month, if Nifty does not move (which is impossible), both the options will become zero on the expiry. The buyer loses everything and the seller gets to keep all the premium. This is the reason why most trading happens on ATM options. 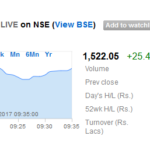 Sellers of ATM think they will keep all the premium or most of it as the stock will not move in future because its not moving now. Buyers think exactly the opposite, that the stock will go up or down so let me take a balanced risk. They do not buy ITM (in the money) as they have to pay a lot. And they fear buying OTM (out of the money) because they know chances of winning is less. So they buy ATM options. And since the buyers usually want to make money both sides a straddle is bought. Meaning they end up buying both ATM call and put. WORST TRADE EVER! When I get calls from traders who are stuck at this position (buy both at the money call and put options) I actually get very angry. Their point of view is that they will make money wherever the stock goes because they are trading both the directions. Little do they realize that they have traded long volatility (it has to increase) and time is running against them like a time bomb. OR the stock has to trend in one direction too much in too little time. Both of the above is impossible to time. You can now guess what I will say next. Avoid trading Iron Butterfly. You cannot time volatility, and volatility does most damage to ATM options. A 10% drop or rise in volatility is common. So if you trade Iron Butterfly, sometimes you will make good money, some times you will lose. Overall the trade will not be profitable over a long period of time. Hope those who trade Butterfly now understand why you lose money when you sell ATM options. That’s because either the stock trends too much, or volatility increases. For ATM option buyers its even more difficult, they have to fight time, the volatility has to increase and the stock has to trend and trend fast. If volatility drops, the premium too drops and overall they lose. Both the risk and reward is limited. Now let me take real premiums and try to explain Iron Butterfly. Date: 1 May 2015. Markets closed. Spot Nifty: 8181. We treat 8200 as ATM. 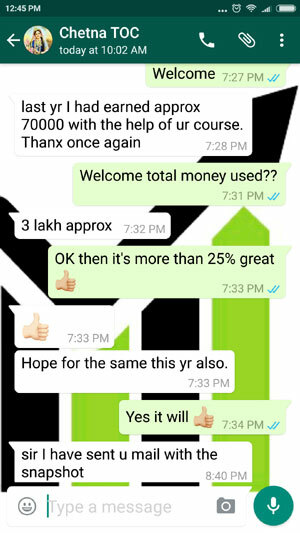 Total margin blocked: 8 lots sold * 14000 = 112,000, buying comes for free. Note: An experience trader will wait for the volatility to reduce, and he will take out his profits. Where you are satisfied with your profits is something that no body can teach, but whenever there is a reasonable profit, they quit. It is the inexperienced traders who wait for the expiry because they want to take 100% of the profits which rarely happens. 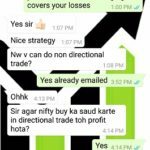 However we need to calculate the profit and loss on the expiry day to explain this trade. So the trader profits only if Nifty closes close to 8200. Even if it is 100 points away the trader loses money. What are the chances that Nifty will close exactly where it began at the start of the series? Very low. Therefore professional iron butterfly traders trade this as a volatility game, and exit as soon as there is a drop in volatility. A slight movement will not be able to damage the iron butterfly because the sold options are hedged. The sold options’ delta is higher than bought options’ delta and theta has Max effect on ATM options, if volatility drops this trade can give 2-3% return in days. That is enough for professional traders. Do NOT wait till expiry, your profitable position may get into trouble. Though the loss is small, it may happen every time you trade. So waiting till expiry is not recommended. 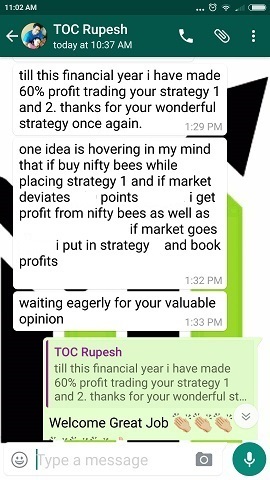 If you are waiting till expiry in any trade than it is not the strategy that will make money for you, it is your luck that will. How many times were you lucky trading? 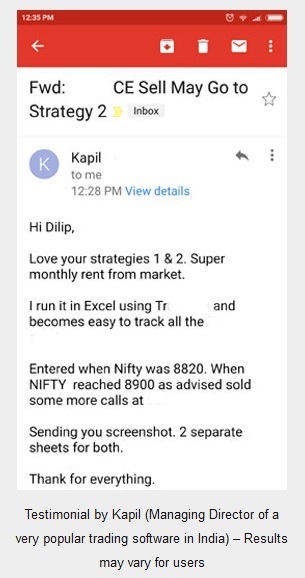 You can wait till expiry only in the strategies that are planned that way, for others you should exit when you are making a reasonable profit. Iron Butterfly is done by selling at the money options of both calls and puts and buying just out of the money options to protect them. It is a volatility trade and not a directional trade or non-directional trade. Timing of volatility is important, else the trade may lose. Therefore it is traded by professional who have an idea of when the volatility is skewed and may drop. Waiting till expiry is not recommended. Exit whenever you are making a reasonable profit. Have you traded the Iron Butterfly? If yes when do you exit the trade? Thoroughly explained .i always thought iron butterfly is a non directional trade and often thought of trading it. But now understood it is not advisable to trade by a retail investor like me.Your articles are eye opener. By the look and structure, yes it looks like a non-directional trade. So its not your fault. Someone selling ATM options is clearly selling Volatility assuming it drops and they buy it back. Works great in stocks. For example sell ATM call and put of a stock just before the results are out and hedge them – the iron butterfly is a perfect trade for that. Once the results are out and IF THERE IS NO MAJOR MOVEMENT – the trade will be in profit in hours. People reading this, please paper trade before you jump in to make money.